The Stirling Smith is well known as the home of the world’s oldest curling stone (1511), football (1540), early golf clubs and balls, and specialist early fishing equipment. The latest addition to the collection of sporting memorabilia is this magnificent draughts trophy in the form of a draughts board. It was competed for between 1902 and 1935 and on the last three occasions, won by J. Scott. The board is designed to be wall mounted, like a roll of honour. However, it can also be used to play draughts. It is quite unusual to find a sporting trophy which has a practical as well as a decorative use. The white squares are hallmarked silver pieces, each inscribed with the name and year of the winner of the trophy. These were made in the Denmark Works of George Wish Ltd, Sheffield in 1904. 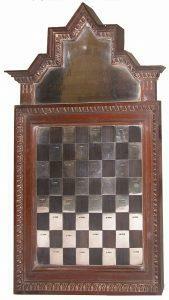 The black squares are of lignum vitae, the hard wood of which bowling balls were often made. The board is the generous gift of Marion Scott of Polmont.